We want to take this opportunity to thank you for following the blog. I started this project two years ago, and I love the friends that we have collected along the way. For the past two years we have posted weekly (with a few exceptions). However, at this point, we are in a transition with the project, and we will be making a few changes. To that end, we will be going to a less rigid schedule and scaling back on the frequency of our posts while we work on those changes. Therefore, you can expect a few less posts in the next few months — but we will still continue posting and keeping the blog updated with fresh content. If you are following us on Facebook, you can also follow us via email so you get every one of our posts. 1. A Belief Statement: You must be a devoted follower of Jesus Christ to write for Beulah Girl. Please submit a brief few sentences about your spiritual journey and your beliefs (if they are not clearly stated on your blog). You can provide a link to your church website if your beliefs are not clearly stated on your blog. 2. A Blog Link: As alluded to in the previous bullet, you must have a blog or website where you are a regular writer. Please send us a link to your blog. We prefer that you have several articles (a minimum of five) for us to look over. The blog does not have to be a spiritual blog, but we request the link so that we can get a feel for who you are as a writer. A lesson that God taught you through an everyday experience. A story in your life in which God is teaching you about who you are and who He is. Advice you would give to someone else going through a similar situation (how you reached healing in an area, etc.). Writing that fits in one of the following categories: Spiritual Life, Emotional Health, Physical Health, Ministry, or Relationships. Quotes or excerpts from relevant Christian books or sites are fine – but all information that is not original must be properly quoted with reference to the title and author (and no posting of any information that is copyright protected). Keep quotes short. Bible passages can either be referenced or given in entirety. Keep passages short. Provide chapter and verse reference; if not in NIV, please note in parentheses. Posts should be civil in tone and not slander family members, friends, other bloggers, church leadership, church members, etc. Posts that challenge certain actions of people that are not in conformity with Scripture are acceptable as long as civility is maintained — and an attempt to protect identity of those in close circles is maintained. Discretion is encouraged when discussing sexual or otherwise controversial topics. No derogatory or racist language. If we are interested in using you as a guest post, we will contact you via email and let you know when we will publish your piece. We reserve the right to decline any submission, and we will only contact you if we plan to use your piece. In addition, we edit submissions and reserve the right to take out or add any lines before publication (we will let you know in writing of any changes). Thanks for your interest, and we greatly appreciate you as a reader of Beulah Girl! In Percy Bysshe Shelley’s poem “Ozymandias,” the lines describe a traveler who finds the ruin of a statue of a ruler. Stamped on the pedestal are these words: “My name is Ozymandias, king of kings: / Look on my works, ye Mighty and despair!” The words are ironic because the statue, depicting a ruler influential enough to have a statue made, is broken to pieces and sunken in the desert sand. Nothing but a wasteland of barren earth stretches beyond his hand. The obvious meaning of the poem is that our accomplishments, however great, won’t last forever. However, my definition of valuable work was somewhat skewed. I deemed something of worth if it was esteemed by a great number of people. If it made it into the public arena for some reason. Perhaps your definition is similar. Or perhaps you carry around a different definition. Perhaps “important” to you means a title from a certain institution. Maybe it means a certain degree. Maybe it means a level of achievement. For we are co-workers in God’s service … . But each one should build with care. For no one can lay any foundation other than the one already laid, which is Jesus Christ. If anyone builds on this foundation using gold, silver, costly stones, wood, hay or straw, their work will be shown for what it is, because the Day will bring it to light. It will be revealed with fire, and the fire will test the quality of each person’s work. The passage makes a clear distinction right away about the kind of work God wants us to labor in. As verse 9 states, we are “co-workers” with God. To be truly meaningful, our work cannot be an effort of individual willpower. We must rely on God’s help and directive and labor with Him in the process of all we do. When we fulfill the tasks God ordains us to do and walk in His will, we build on the right foundation using “gold, silver, costly stones” (v. 12). Christ modeled this kind of work when He continually stressed that He only did what the Father told Him to do — and declared that work “finished” when He died on the cross (John 19:30). In contrast, if we try to build in our own power, our work will not stand the test of time. As Bill Gillham notes in Lifetime Guarantee, our own fleshly pursuits are merely “the wood, hay or straw” that will not last, even if built on the right foundation (v. 12). We can do work that looks good and might even look spiritual, but working without the right motives and not allowing God to work through us will be revealed with fire (v. 13). A few years ago, when I left teaching and surveyed my years as a teacher, I felt that I had done a good job. I considered myself an excellent teacher. But then I began to get God’s perspective on my time as a teacher and realized I had squandered much of my time and energy on being liked and worshipped by my students. And the hard things I walked through after teaching revealed my career for what it was: mostly a shrine that I had attempted to build to myself. Yes, there were those moments when I felt God directing me to speak to a student, and I did. And I know that God had me in that particular school. But even as I felt that I was supposed to teach for that particular season, I didn’t take the opportunity to be a godly example to my students or consider how each day could be an opportunity to act out of God’s will. Largely, when God put the magnifying scope on my years in a high school setting, most of what I considered I was crumbled, and the truth emerged that I was more addicted to man’s approval than God’s. On the other hand, I can think of specific instances in the last few years that have appeared like a disaster from a human standpoint — like I have failed even though I did as God directed. But as time has gone on, those “failures” have begun to look different in hindsight. For instance, a few years ago, I felt I was to initiate a conversation with some fellow believers about an unhealthy situation they were involved in. It was very awkward for me to bring up the problem, but I felt strongly to do it. They listened quietly, and as I walked away from that conversation, I knew that I most likely would not be welcome in their presence again. I also did not know if they would accept my advice. They did not. They continued on down the path they were on. They didn’t say anything further to me but cut off contact with some people we both knew. In some ways, I wondered, God, why did you have me say anything? However, as time has gone on, I learned more about the situation they were in and how they had gotten in even deeper in an area that God had me address. Though I didn’t see and haven’t seen any signs of a change in either one of them towards separating themselves from their harmful environment, I do know that my words (not mine, but God’s) are true whether they embrace them or not. That even if they choose never to listen or turn away, these words may come back to them at a later time. Because God’s Word stands whether we listen or heed His words or not. And God has specific works for us to do whether we know it or not. Ephesians 2:10 states that God has prepared works for us in advance to do. Isn’t that thought amazing? That maybe all we are thinking about today is the sweater we want to buy at Marshalls, the ingredients we need to pick up at the store for dinner — or making it through the day without going crazy with our small children underfoot. But God has eternal plans that He wants to use us for. Sharing an area of healing we have had with a friend. Giving a sum of money away to a family in need. Scheduling a meeting with our pastor to talk about starting a ministry in our church. Nurturing our children with God’s love and teaching them His precepts. Whatever small or big thing God may be nudging us to do today, those things are important and significant not because anyone will necessarily see us doing those things, give us an award for doing them, or help push us from obscurity into the public for doing them. 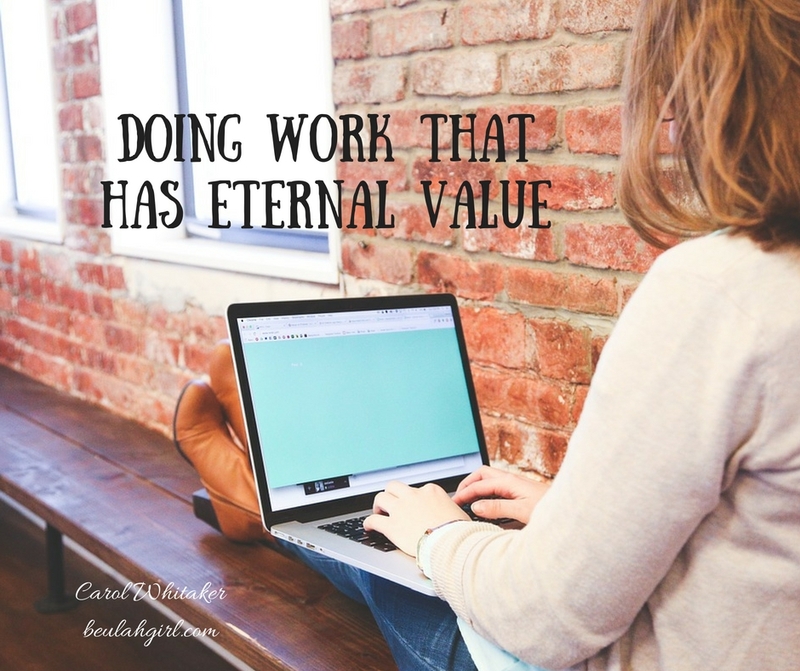 Those things are important and significant because God wants us to do them, and they hold eternal value because He promises that those things we do that He directs us in will bear fruit — the kind that we can’t bear in our own strength. The fruit which stands the test of time. So the next time you are thinking about how you can make your work more meaningful, ask God for His perspective. Ask Him what He would have you do for Him. You just might be surprised by the answer! Let’s pray: Lord, you know that we want to do things that are meaningful for You. But sometimes we get off track and do things that will bring glory to us or push ourselves into the spotlight and get praise from man. Help us to focus on You and do what will please You and bring glory to You. Forgive us for the ways we have fallen short. In Jesus’ name, Amen. 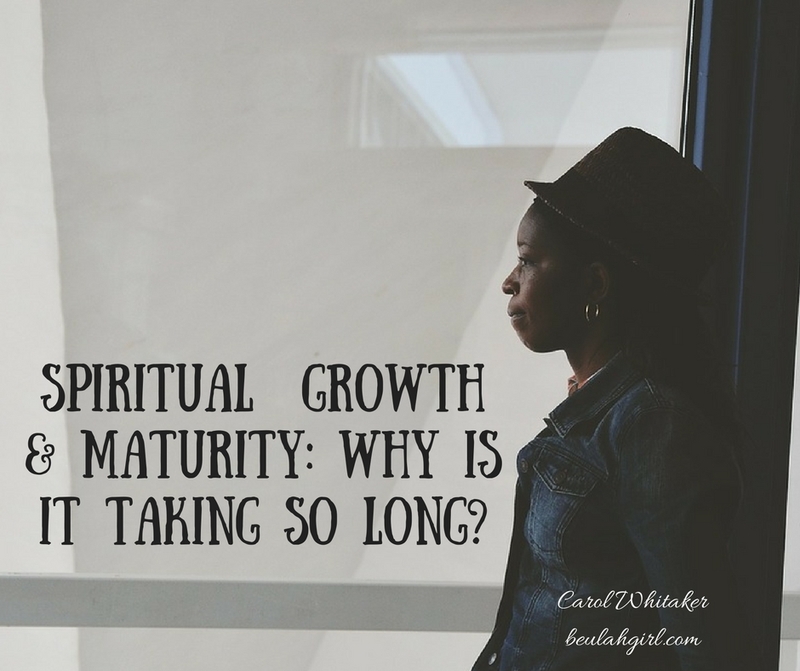 Spiritual Growth and Maturity: Why Is It Taking so Long? My son has been potty-trained for two years. However, though he is potty-trained, it has taken some time to learn to use the bathroom on his own. When he does business that requires a long sit-down on the commode, I have to remind him how much tissue to use, how to rub soap to get the germs off when he washes his hands, and how to untangle his clothes and get them back on his body. I been issuing these same instructions for two years. Though he is getting more adept at remembering what to do, he still needs me to monitor him. He sometimes forgets a step or struggles to get his own clothes on or hops off the toilet in the middle of business and wants to play. Though we are making progress — the boy is no longer in diapers — the progress is slow. I sometimes wonder if this child will ever be able to be in the bathroom alone without my assistance. It sometimes feels like my journey to spiritual maturity is taking just as long. Getting into a rhythm with God where certain bad habits are overcome for good, where I obey the second He calls, where sin doesn’t have a hold on me — is taking longer than I want it to. However, as I was thinking about rhythms this morning, I reflected on the fact that “getting into a rhythm” takes time. You have to learn it. Feel it in your bones before you can join in or snap to the beat. I remember my former choir instructors actually snapping out the beat with their fingers to themselves before they would raise their arms, look at the choir or orchestra, and begin directing. They had to feel it before they could direct us in song. When we are discouraged with where we are at spiritually, there are several things Rick Warren points out in The Purpose-Driven Life about spiritual maturity we should keep in mind. 1. God is not in a hurry. While we want a magical transformation where all of our fleshly ways are remedied at salvation, that isn’t what happens in the Christian walk. We may have a dramatic salvation story and turn from whatever lifestyle we are engaged in, yes, but it takes time to learn to walk in God’s ways. An entire lifetime, in fact! First, they would ‘soften up’ an island, weakening the resistance by shelling the enemy strongholds with bombs from offshore ships. Next, a small group of Marines would invade the island and establish a ‘beachhead’ — a tiny fragment of the island that they could control. Once the beachhead was secured, they would begin the long process of liberating the rest of the island, one bit of territory at a time. Eventually, the entire island would be brought under control, but not without some costly battles. As Warren stresses, God gets a beachhead in your life, but then he begins His strategy to take over the whole island. Why? For the purpose of liberation! Rather than get discouraged when we compare ourselves to others and see that they are further along than us, our job is to submit to the work God is doing at the moment and trust that as long as we are surrendering to Him, He has us right where He wants us. 2. Certain habits that took time to learn may take time to unlearn. As Warren notes, we may be struggling with a habit that took years to develop. A quick fix or solution is not realistic. It may take us some time to overcome this. Rather than give up on ourselves or look for an easy out from the pressure we may feel while God is operating on us in this area, we should be patient with ourselves and know that the working out of this trait may take some time. If our struggle is with fear or pride or self-sufficiency, we may have moments of victory but then other moments where we fall back into old patterns because they are comfortable and it’s what we have known for much of our life. Rather than beat ourselves for our failures, we need to turn to Jesus, confess where we have fallen short, ask Him to help us in our weakness, and allow Him to guide us towards lasting victory (John 1:9). 3. We need to find friends to come alongside us. As Warren stresses, we don’t do ourselves a favor when we try to keep the sin or habit we are struggling with a secret. Pride says that we should hide our struggles, but there is freedom in admitting our struggle with another person and asking for help and accountability. The Bible says that those who confess and renounce their sins will find mercy (Prov. 28:13). Perhaps there is a group you can get plugged into or a wise Christian friend that you can regularly meet with. Relating your struggle in an area with another person can help keep you accountable and make ground against this thing — rather than stuffing it down and keeping it silent, so that it just turns into a shameful thing you try to hide. Your friend or prayer partner can also help you make a plan to avoid situations where you will be tempted to act in ways you know you shouldn’t. Just as it takes time for fruit to grow and ripen on the vine, it takes time for us to mature spiritually and develop the fruit of Christ-like character, as well as develop the ability to effectively minister to others. Knowing that this maturation is a process can encourage us when we feel like our struggle with the same old habits or sins will never end; we can know that God is always working. The one who can stand in the way of this is us! So, as Warren says, let Him do as He pleases and trust that He who began a good work in you will complete it (Phil. 1:6). Several weeks ago, I did a video chat on fear. All of the other members of my blog were busy, so I decided to do it alone because I felt the message was one that was important and needed to be put out there. I typed up an outline of notes, went to the library to print them out (because our printer hasn’t been working for some time), and went through them a few times to rehearse for the event. I fed my kids, put them to bed and then hurriedly touched up my makeup and changed into a nice shirt and finished off the outfit with a necklace (which, by the way, I hardly ever wear because jewelry is a thing of the past now that I have a brood of messy kids). I went downstairs, laid out my notes, and logged into the computer to start the chat. I began it right at 9, but as I began talking, it was like a giant pin burst my bubble. The one person in the chat who had shown up decided to leave and swing back around. Approximately no one was in the chat area after that. I couldn’t hear my voice in my headphones like I normally do, and slowly, I began to melt down like an ice cream cone in August heat. The one thought in my head: Why am I doing this? And I considered just stopping right then and there. Closing up shop. The careful notes I had written, the frantic run to the library to print out notes, the effort I had taken to put my kids to bed (with promises of “sugar cereal” in the morning if they stayed quiet and in their beds), the rallying of my tired, then very pregnant body to get in front of the computer at night for less than three people to show up (and a few more that didn’t identify themselves in the chat). I paused the recording to get in touch with help because I wasn’t even sure if my voice could be heard. The technical person got me back on track within minutes, and I finished the chat as best I could — feeling silly, alone, and pointless. What is this all for, Lord? My heart cried before I went to bed that night. But I suppose the better question should have been: Who is this all for? Because that is what I really wanted to know. The planning. The preparation. The work. The sacrifice. And what I mentioned was just some surface stuff. I had some real and troubling conflicts in my life at the moment because of the blog and the choices I constantly made to make time for it. I was a little ticked off in reading that because I wanted to be comforted, not assaulted by my own self-absorption. However, wanting the applause of people was a constant struggle for me. 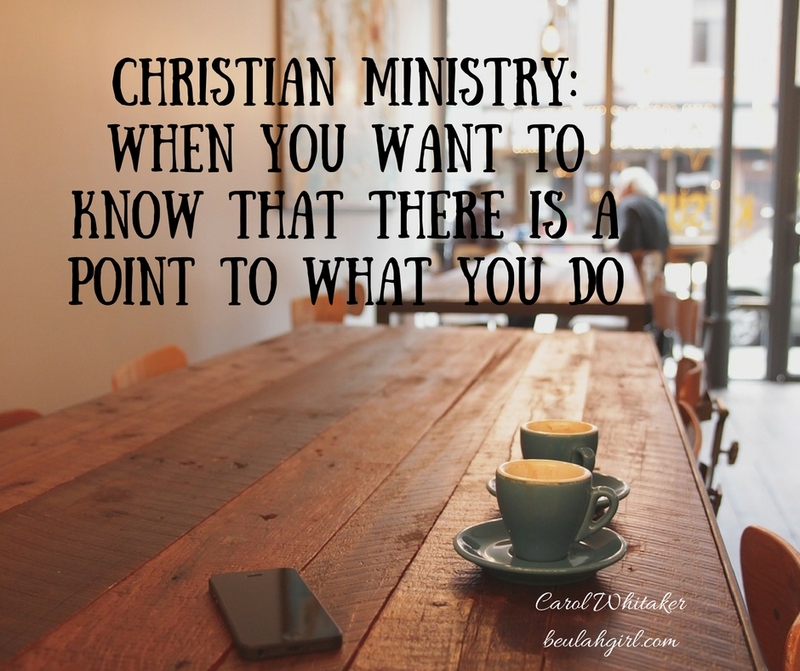 Even in a ministry aimed at pointing women to Jesus and finding healing, I wanted to be the point. I wanted to be liked and have millions of Twitter followers and be esteemed for my message. I didn’t think I was successful if only a handful of people showed up for my video chat. But maybe that handful were important enough to Jesus that He send me that message for them. After all, Jesus was willing to leave the 99 for the one. He didn’t worry when He was talking to the woman at the well or the young rich man or the crippled man on a mat that He was spending so much time on one. He wasn’t urging His disciples to catch the moment on Instagram or send out a Tweet about His good deed that day. No, He did it because He was always about His Father’s work, and His Father’s work often included the one. I heard a story once of a man who felt he needed to go to a particular logging town and give a sermon. When he got there, he found the town completely deserted. No one was there. Confused, he walked into the chapel they had there and felt very strongly to give his message to an empty room. So he did. And after the message, he felt like his mission was accomplished, so he left and had no idea why he had done what he had. Years later, he was approached by a man and thanked. The chapel hadn’t been empty after all — there had been a man hiding in the back. He chose not to reveal himself, but he had heard the entire message — and when the rest of the camp returned, he told everyone the message, and the entire camp was saved. When we make Him the point, there is always a point to what we do. You see, we do what we do not for others or to be seen by others, but for Him. And it just so happens that others get blessed in the process of our obedience — even when we give chats to invisible audiences and sermons to “empty” rooms. John the Baptist said about Jesus, “He must increase, but I must decrease” (John 3:30, ESV). When he said these words, John had no idea how these words would come to play out in his own life. Some time after he made this statement, John was thrown in prison. And while in prison, John had a very human moment when he sent a messenger to Jesus and said, “Are you the one who is to come, or should we expect someone else?” (Luke 7:20). Clearly, John was concerned because things weren’t exactly going the way he thought they would. And Jesus sent him back this response, “The blind receive sight, the lame walk, those who have leprosy are cleansed, the deaf hear, the dead are raised, and the good news is proclaimed to the poor. Blessed is anyone who does not stumble on account of me” (Luke 7:22, 23). John the Baptist, considered by Jesus to be one of the greatest in the kingdom, didn’t get an explanation as to why things were going the way they were. Only that people were getting healed and set free, even as John himself was in the background, in the shadows — about to be executed. Have you ever felt like your work is in vain? The risks you have taken? The hard conversations you have had at Jesus’ prompting? The relationships that have been strained or lost when you did what God asked of you? And it seems like what God asks of you just requires you to decrease more and more, and you wonder what He is up to? Yep, me too. But John the Baptist’s words and life remind us that success in the kingdom of God often looks upside down or backwards to us. Some of the ways God will ask us to minister won’t make any sense to our human reason. He won’t always answer our whys or respond to our questions in the way we expect. We might wonder if what we’re doing matters. If what we’re doing for Him is worth everything we’ve lost. And so, I’ll continue. To dress up. To show up. To do things that feel pointless and confusing because He has told me to. Because it’s not about me. When I make myself the focus, I look for the huge audience and recognition. I look for things to go the way I want. But when I make Him the point, I let Him orchestrate events the way He wants to. And I leave the results to Him. Because after all, isn’t that the point?